We motored down back out of Clayoquot Sound and decided to take a pass on visiting Tofino. 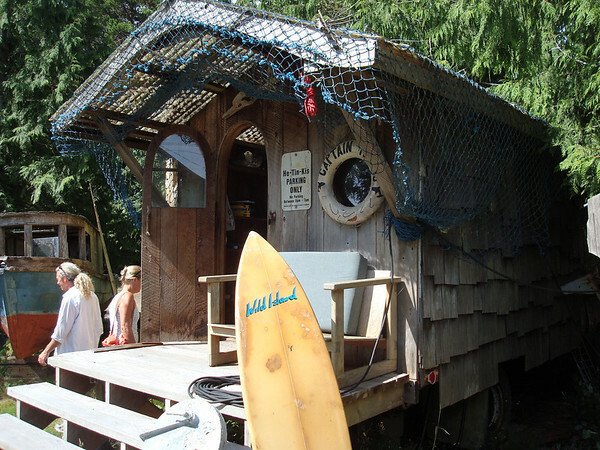 We chose to get down into Barkley Sound and get our city fix from the small hamlet of Ucluelet. We got out of the sound and out into the Pacific to find the same 4 to 6 foot swell out of the northwest that we bobbed around in the previous day. 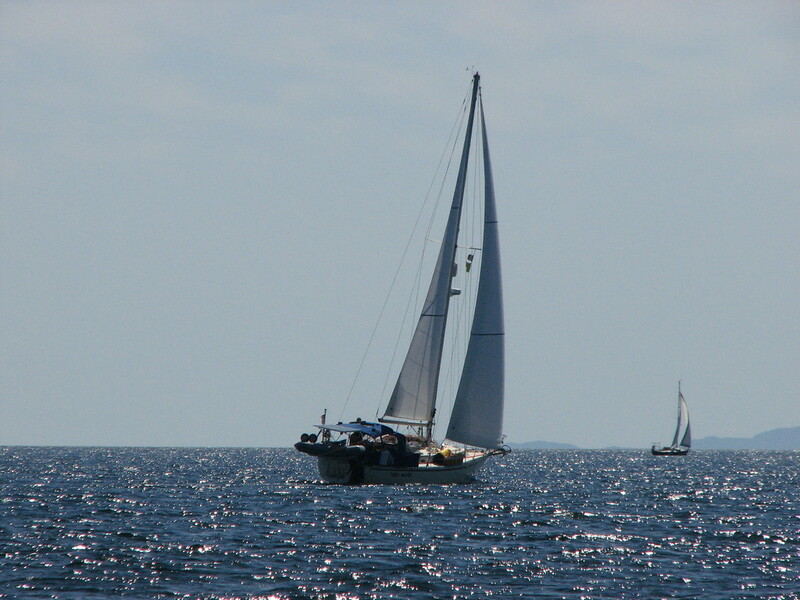 However, this time we got a nice spot of wind to sail in so the boat was much more stable and the ride more enjoyable. We ended up on a broad reach until about 7 miles offshore before we jibed and ran dead down wind towards Amphitrite Point. Once again, we put away the main and just ran under the headsail. And just like before, the wind piped up in the afternoon to 20 knots plus giving us some great downwind sailing. Every time we sail somewhere, Christy wants to put the sails away at the last possible second. She wants to wring every last second out of the sailing experience. I, on the other hand, want to put the sails away early enough to give us time to deal with something going wrong before we get to close to all the pointy, sharp geology that's rushing at us at 7 knots. This entrance was no different but after rolling her eyes a few times, Christy let me put the sails away as the entrance into Ucluelet Inlet is one to pay attention to. We anchored in Spring Cove, about a mile south of Ucluelet and tucked in for the night. The next day, the Happy Camper crew and the Hello World crew piloted their respective dinghies the mile or so up Ucluelet Inlet into town. We parked the dinghies in the most out of the way spot we could find (still not out of the way enough to suit the harbormaster we came to find out) and walked into town. 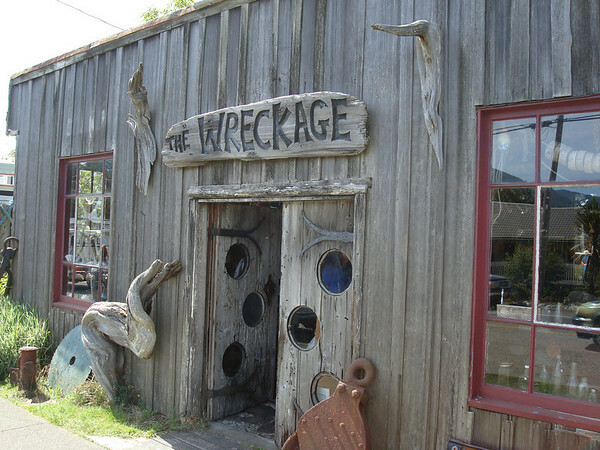 As we strolled by this shack/store with a sign reading The Wreckage, we pondered aloud what it was all about. A guy on the sidewalk declared: "I can let you in if you want." Turns out this guy lives in this... well... let's call it a cultural garden. Junkyard is far too harsh a word. 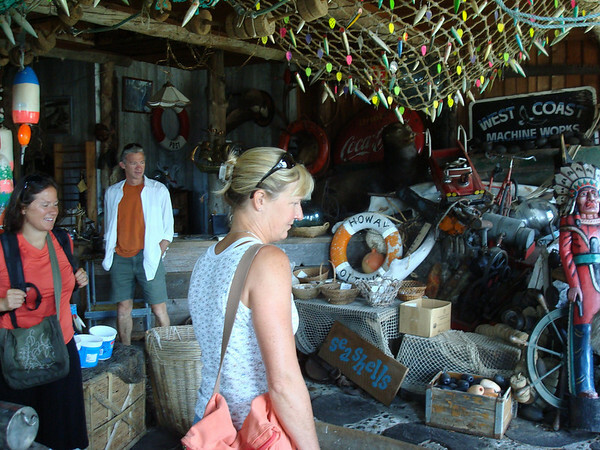 While it is piled high loads of junk, it's all very neat and tidy and interesting. 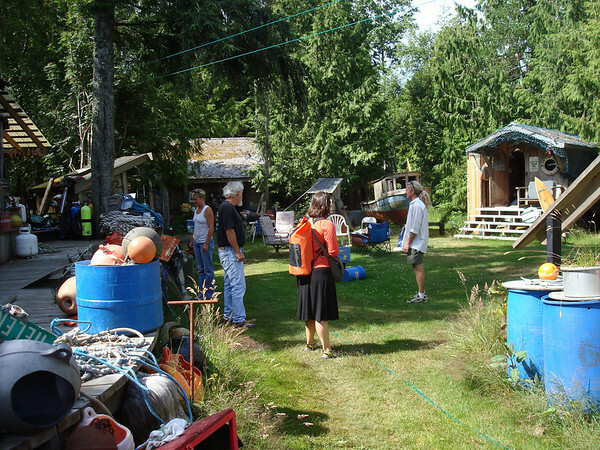 Loads of Vancouver Island memorabilia is scattered around the yard and in the "store". We wandered through while he gave us stories of the history of much of the stuff lying about. 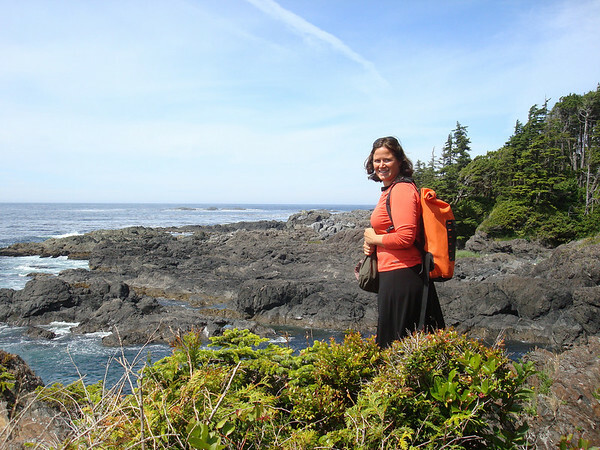 We very much enjoyed Ucluelet. It's not a big enough town to be useful beyond anything touristy. But it has a nice feel, is imminently walkable and friendly. But you never forget just how far away this pocket of civilization is from the rest of the world. 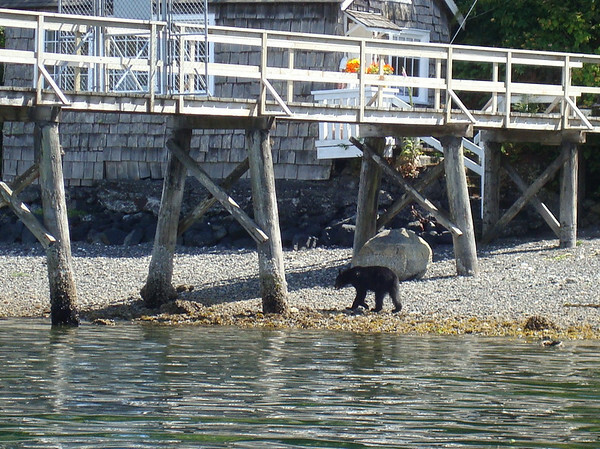 As we dinghied back to the boat through town, we watched a black bear moseying down one of the town beaches. How can you not want to know what this is about? The back yard of The Wreckage. 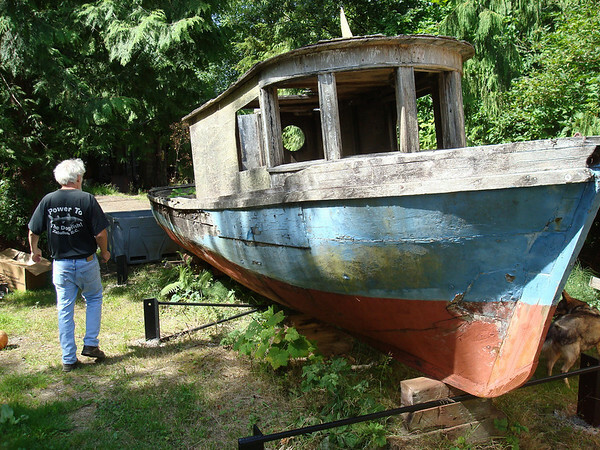 The hull of this boat was dugout from a single log. This was his "guest house" which was actually a camper on the back of an old Dodge pickup. Also, his mother used to live in this camper. It just kept getting more and more interesting the longer we talked to this guy. Inside the store. I guess it was a store? I couldn't tell if stuff was for sale or just there for the looking. 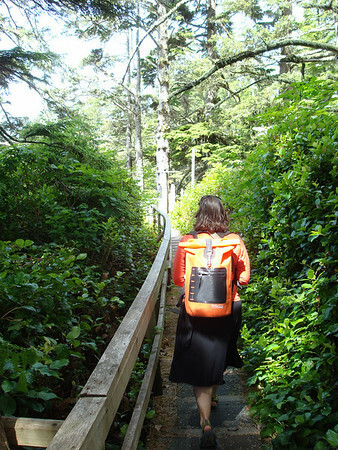 Walking the Wild Pacific Trail on the Pacific coast outside of Ucluelet. Christy looking out over the Pacific. Just a bear, ya know, hanging out downtown. YAY!! Thanks for doing the recon on the little town - can't wait! OMG, We are going to see you tomorrow, matt and I are so excited we just pee'd ourselves a little bit. Wow - I don't believe you took a pass on Tofino and it's incredible beaches. Ucluelet (while nice, and good place to land a canoe) is a dump in comparison. Kenz - can't wait to see you guys! I'm cleaning your toilet right now so the next time you need to pee a little you'll have a sparkling marine head available. Ben - if towns are important to you, perhaps you're missing the point of the west coast of Vancouver Island. You're right. So is the World Heritage Society and the national park system of Canada. Ben, Tofino pumps it's sewage directly into the Ocean and runs out of water while in the midst of a rainforest - that's a dump if you ask me. Ucluelet has neither of these issues.